Former middleweight champion Chris Weidman (13-3) hopes to snap a three-fight skid on Saturday when he faces Kelvin Gastelum in the UFC on FOX 25 main event. Gastelum (13-2, 1 NC) is returning from a 90-day suspension for testing positive to marijuana following his TKO win over veteran Vitor Belfort in his last outing. Due to the positive test result, the dominating win was downgraded to a no contest. Weidman will fight to remain relevant in the division that he once reigned over, while Gastelum wants to pick up where he left off before his suspension. 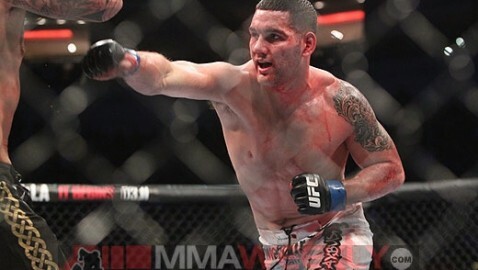 Both fighters have a lot on the line, and Weidman predicts that he’ll finish the 25-year-old contender. Weidman expects to put Gastelum away at Nassau Veterans Memorial Coliseum in Uniondale, N.Y., on Saturday, but believes the young southpaw has a bright future in the sport. “I think one of the big parts that makes people successful in this sport is not just the talent that people have, it’s more like not being afraid and going out there and not being afraid to get hit and believing in yourself,” he said. “Kelvin is definitely that kid, so I definitely think he’s going to have success in the sport regardless of what happens in this fight because he’s definitely not afraid to get hit. He moves forward. He’s now been in there with some bigger guys that have touched his chin and he lets it go. That alone will take you far,” said the former champion. UFC on FOX 25 will be the first time the fight promotion has hosted an event on Long Island.